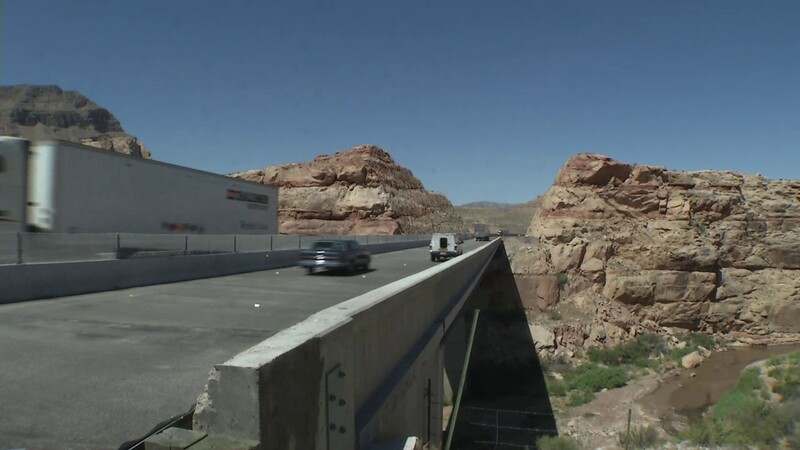 ST. GEORGE – Motorists who traverse Interstate 15 through the Virgin River Gorge will notice some relief on the roadway as the Arizona Department of Transportation announced Tuesday it has finished a series of bridge rehabilitation projects in the gorge and lifted several traffic restrictions in the area. ADOT has completed work on three bridges located at milepost 13 (Bridges no. 2 and 3) and milepost 22 (Bridge. no. 7). This part of the project has cost an estimated $2.8 million and has included the upgrading and repairing of the bridges which were built in the 1970s. Travel restrictions through the gorge – such as one-lane travel and lower speeds – will be eased with the completion of the bridge work. However, work will continue on Bridge no. 6 at milepost 16, located approximately 20 miles south of St. George. Work on this bridge is expected to remain active through 2016. Work on Bridge no. 6 includes replacing the superstructure, as well as widening the roadway through the gorge. When this section of highway was built, it was the most expensive rural interstate highway built, per mile, when it was completed in 1973 after a decade of construction. Work on Bridge no. 6 will ultimately serve as the foundation for a new bridge. The estimated costs of this portion of the bridge work in the gorge is estimated at $27 million. Road restrictions will remain in effect in the Bridge no. 6 construction zone. Travel will be reduced to a single-lane, as will traffic speed which tends to fluctuate between 20-40 mph while passing through the area. Motorists should expect delays. During times of heavy traffic, the Arizona Highway Patrol often recommends travelers use Old Highway 91 as an alternative route. The highway bypasses the gorge entirely, intersecting with I-15 at Littlefield, Arizona, to the south, and connecting to St. George at the north via Santa Clara and Sunset Boulevard. See map included in this article. ADOT works to inform the public about planned highway restrictions. Unscheduled restrictions or closures may occur. To stay up-to-date with the latest highway conditions around the state, visit the ADOT Traveler Information Center at az511.gov or call 5-1-1; outside Arizona, dial 1-888-411-ROAD (7623). For more information about these projects can also be found on the I-15 Virgin River Gorge website. yessirree! now i can get home quick with my booze.